Rock Band is amazing. It's a game that brought people together like no other, using a catalogue of classic tunes and some plastic instruments. I'll never forget the way it had my non-gamer friends picking up guitars or drumsticks, or the time my family played through the entirety of Beatles: Rock Band, start to finish, on a vacation. But those plastic instruments aren't exactly conducive to quick gameplay sessions. They take a few minutes to drag out and set up. The banging and jumping around upsets neighbors. And if your instruments are anything like mine, they've been played so much they don't even work properly anymore. Rock Band Blitz delivers the rock band without the need for instruments, which at first seems completely bizarre. It's a lot less weird if you played Harmonix's 2009 PSP installment in the series, Rock Band Unplugged. Like Unplugged, Blitz has players taking control of all the instrumental tracks that make up a song, switching from track to track to hit the notes. Instead of color-coded instruments, the Xbox 360 controller's triggers are used to hit notes, while the analog stick moves you from lane to lane. Simple-but not easy. To mix things up even further, the game provides power-ups to help you get a higher score. Rockets clear notes, bombs blast them away, and a giant pinball increases your score when you can keep it from falling off the screen. With so many things going on at once, Blitz can get pretty chaotic, though that's part of the fun. 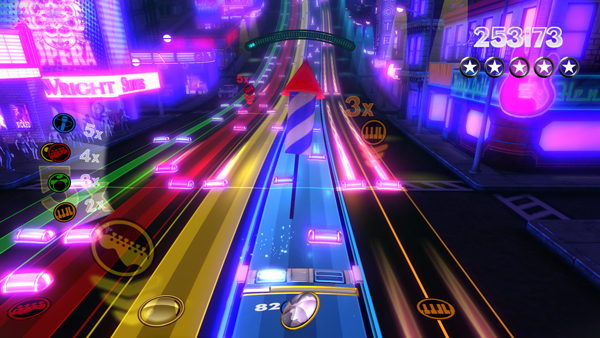 Unlike the group action of the previous Rock Band games, Blitz is a single-player game, though it does have leaderboards that allow you to see friends' scores. This feature works really well in creating a sense of competition without the need for two people playing at once, and I spent my playtime attempting (and failing) to beat the high score of one of the Harmonix developers. The game only comes with 25 songs, but here's the best part: all of your previous Rock Band DLC can be used in Blitz. That may not benefit everyone, but I've spent countless Microsoft Points so that I could have tracks like "Paradise by the Dashboard Light" in Rock Band, and I love the idea of having a built-in song library for Blitz the moment I download it. Perhaps the greatest testament to Blitz's addictiveness is the fact that I was still thinking about it hours after I left the show floor. Somehow, that simple formula had seeped into my brain, along with "Jessie's Girl" playing on a loop, and I couldn't wait to try it again. For rhythm and Rock Band fans, this downloadable delight seems like a no-brainer when it's released later this year for XBLA and the PSN.